The Chairmanship of the Abu Dhabi Dialogue (ADD) was passed from the State of Kuwait to Sri Lanka yesterday at the 4th Ministerial Consultation of the ADD at Cinnamon Lake Side Hotel, Colombo. The Chairmanship successor was Foreign Employment Promotion and Welfare Minister Thalatha Athukorale, who received the position from the outgoing Chair, Hind Subaih Barak Al Subaih, Kuwait's Minister of Social Affairs and Minister of Labour and State for Planning and Development. Minister Thalatha will be the ADD Chairman for the next two coming years. Delivering the acceptance speech the minister expressed her gratitude to the ADD member countries for placing confidence in Sri Lanka with a unanimously agreement to handover the chairmanship. “Number of regional initiatives has to be implemented aimed at effective management frameworks for Asia and the Gulf region. 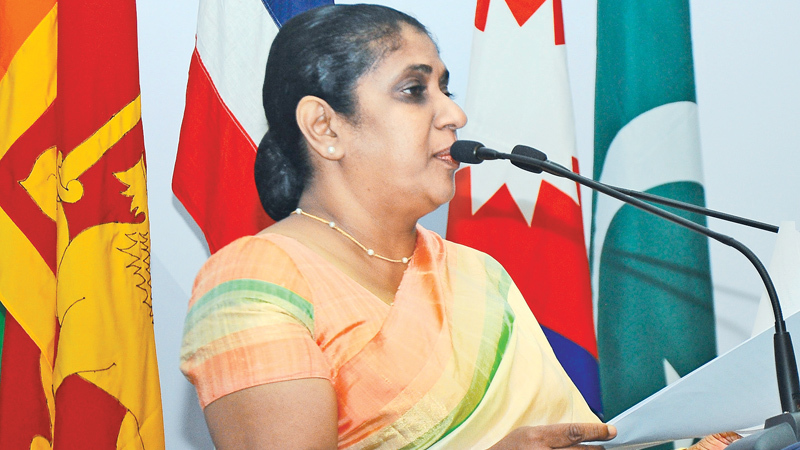 Hence, we have to develop a means of strengthening our transparency and cooperation,” Minister Athukorale said. The ADD should pursue its partnership with its member countries and international bodies to better alight ADD's efforts, she said. “What we need today is not to enlarge our differences but use a telescopic view to look ahead and focus on cooperation regionally and internationally, “Athukorale said. The ADD is a collaborative government voluntary approach to recognise the joint responsibilities of the member state to enforce compliance by the stakeholders engaged in the labour recruitment process with the requirements of the national laws and regulations pertaning to the employment of temporary contractual labour. It is focusing on action-oriented partnerships between countries of origin and destination for development around the subject of temporary contractual labour, based on partnership and shared responsibility. The ADD was inaugurated by Prime Minister Ranil Wickremesinghe. International Organiszation for Migration Director General William Lacy Swing, Foreign Employment Deputy Minister Manusha Nanayakkara and delegates from 18-member countries were present.